Re: “East Hampton to host public hearing on wind farm easements,” May 16. 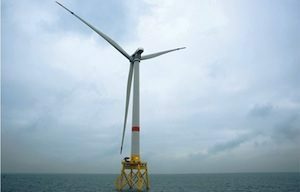 Commercial fishing interests are wary of Deepwater Wind and other offshore wind projects promoted by Gov. Andrew Cuomo, and now by the federal government, if not outright trying to block them. Recently I wondered what a Long Island fisherman, who I happen to know, thought about the issue, so I asked him. “The fishing community needs to listen to the scientists and see the big picture. A generation ago, fishermen were up in arms about limits on how much we could catch of each species. Now, everyone agrees that these limits are a good thing. Some days I have to throw back as much as I keep, but that’s OK.
“You hear arguments from some fishing groups that the wind turbine platforms will limit trawler operations or snag their nets. Well, it’s a big ocean out there, go elsewhere or use smaller nets. Why can’t I use his name? He asked to remain anonymous because all his fellow fishermen are opposed to offshore wind out of fear for their livelihoods. Nevertheless, I hope that there are more fishermen out there who listen to the scientists and see the big picture. It is misleading to describe the community of East Hampton, currently debating easements for Deepwater Wind to lay power cables as “divided”(“A Divided Community Speaks at Wind Farm Hearing” May 20). Rather, the three-hour-long public hearing at LTV’s Wainscott studio May 17 demonstrated a community united in concern about the future. The division comes in the forms that concern takes. Those who fear the effects of the Deepwater project on the local economy and the fishing industry face do not have much evidence. Those focusing on fears of the effects of climate change on the community can point to the certain evidence of rising seas, intense storms, invasive species and so on. We see these events happening. So it seems more prudent to respond to threats we know rather than those we don’t know, especially because the community’s continued involvement with Deepwater would allow a community benefit package and local input. Carl Safina compares the citizens of East Hampton to Carib Indians “arguing which beach Columbus should row his dinghy to.” That comparison does not work when you consider how much information is available to the community about the looming effects of climate change. Offshore wind is vital to Governor Cuomo’s plan to combat climate change by deriving 50% of the state’s electric power from renewable energy by 2030.